Put the 115ml water in a ramekin and sprinkle over the gelatine. Let it ‘sponge’ without stirring it for several minutes until you can see each grain has hydrated. Then melt the gelatine by sitting the ramekin in a dish of hot water from the kettle until you can see it is clear and runny. Line a small (c.15cm x c.15cm) baking tin or gratin dish (anything the right size) with parchment. Sift together the 2 tbsp cornflour with the icing sugar and use some to liberally dust the base of the dish. Set the rest aside for later. 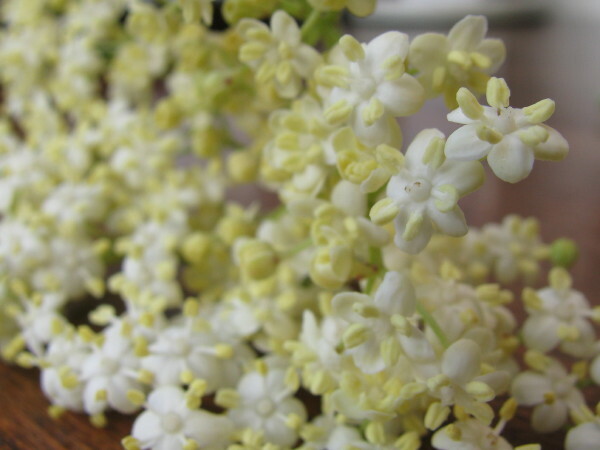 Snip as much stem as possible off the elderflowers and tie them in a muslin bag with string. Stir together the 120g cornflour and remaining 100ml of water in a small bowl to make a smooth slurry. When everything is ready, stick your fingers in the gelatine and the syrup to check they are roughly the same temperature. Now briskly whisk the cornflour slurry and melted gelatine into the sugar syrup and return it to the heat. Slowly bring the mixture to a boil, stirring constantly, add the bag of elderflowers and simmer for around 20 minutes, stirring all the time and pushing the elderflower bag down and around to extract maximum flavour. The mixture will be very thick and bubble like a volcano. It may even be lumpy. Don’t worry – just keep stirring and gently simmering. Remove the elderflower bag, scraping off as much gloop as possible so as not to waste it. Pour the gloop into the prepared dish and let it cool at room temperature. Then chill in the fridge. The next day, use some of the reserved cornflour and icing sugar mix to dust a chopping board. 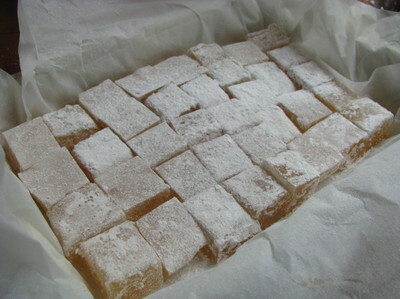 Tip the (now quite rubbery) mass onto it, peel away the parchment, and cut it into 1 inch cubes. Toss these with the remaining cornflour and icing sugar mix so they don’t stick to each other. Delicious.